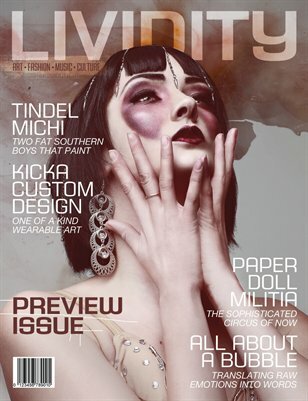 Hello, and welcome to the premiere issue of Lividity! I hope you’re as excited as I am. The team has been hard at work to bring you inside information on the artists you already love and introduce you to some you might not know. Our goal is to give you a closer look into the brilliant minds that fuel the fash-ion and art communities with a beautiful landscape of pictures to help along the way. So, what are you waiting for? Turn the page and enjoy!